During the game's development employees of Team Silent referred to various sources for inspiration in desiging the game. While some influences are expected such as paying homage to famours artists and writers others are just as strange as the town of Silent Hill itself: Christina Aguilera, anyone? Learn more about these interesting influences and the signifigance they play in the game. Maybe not so much an influence as it is an easter egg. During the cutscene of Laura Behind the Piano Laura eventually hands James her letter from Mary. 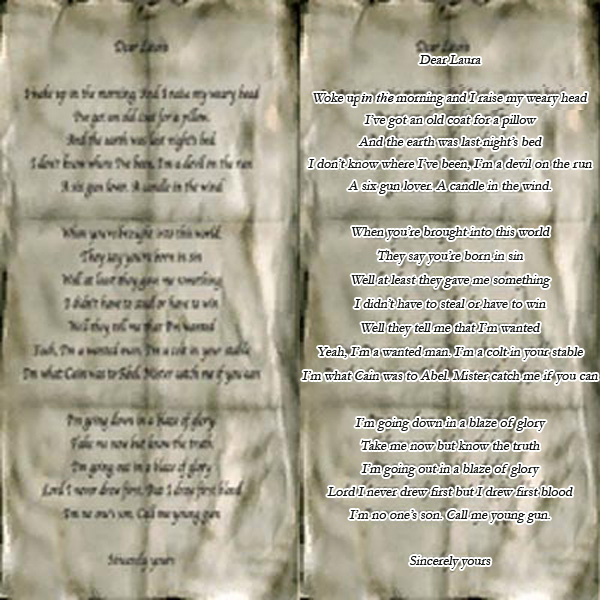 The texture used on the note James holds during the cutscene (in-game) has the lyrics of Bon Jovi's song, "Blaze of Glory." Note the line: "I've got an old coat for a pillow." Con Air was an action flick that debuted in 1997 starring Nicholas Cage. 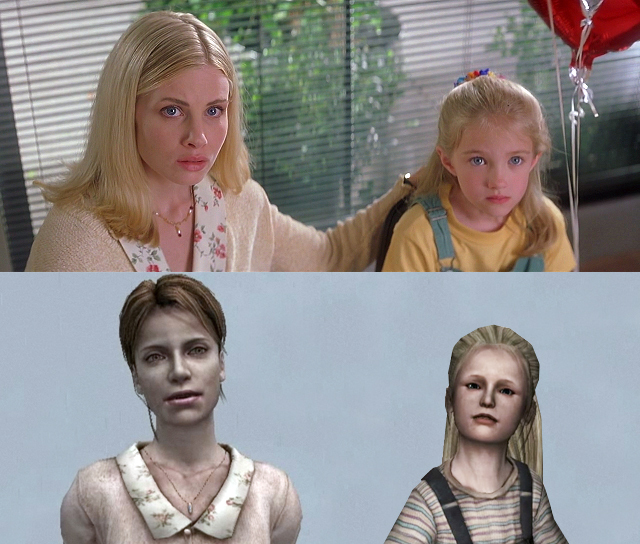 The outfit design for both Mary and Laura in Silent Hill 2 were heavily influenced from the outfits worn in Con Air by Cage's wife and daughter (in the film). Maria's apparel was derived from an outfit worn by the well known pop star Christina Aguilera. Christina wore this ensemble for a photoshoot session and at a VH1 Exhibit. Also, coincidence or not, Christina Aguilera's middle name is "Maria." 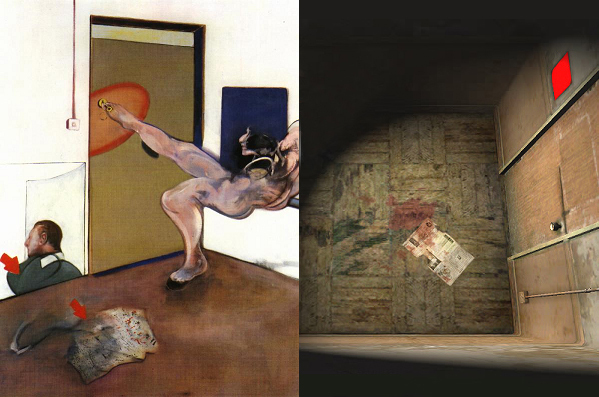 Francis Bacon's piece "Painting 1978" was made into the room in the catacombs before you encounter Angela. Notice the bloody newspaper in both pictures accompanied with the light switch. His work was also used to help create the Lying Figures in the game as many of Bacon's human studies are comprised of twisted, melted or deformed flesh. 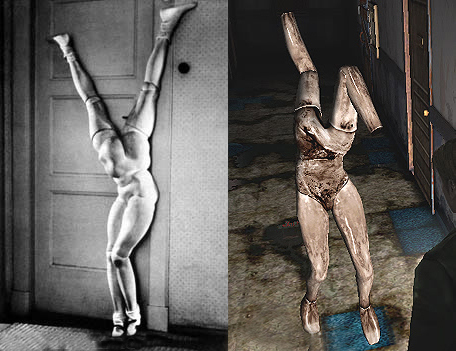 The disturbing creations of Hans Bellmer were the source of inspiration for the Mannequins in the game. Bellmer took various mannequin limbs and placed them in disturbing ways on the torso of mannequins. The picture on the left is a clear example of how this creature was conceived. Team Silent drew much inspiration from San Bruno, California: From alleyways to buildings to garages and even toilets. Notice that Team Silent not only replicated the building's architectures but even the trash cans that sit beside them. Team Silent also replicated actual stores found in San Bruno. To learn more about this, visited the Old Neely Street page.